Outline: Two places where souls go; two roads--- wide and narrow, leading to heaven. Describes the difference. No other way to get to heaven-- not by burning candles, worshipping Mary, sacrificing to spirits, etc. Only through Christ. Invitation. Presupposes knowledge of Jesus and the Bible. The Bible teaches us that when a person dies, only the body dies and the soul does not die. The soul goes to another place - either heaven or hell - and there it will live forever. It will live with God, or it will suffer with Satan. Just as there are two places where souls go, so there are also two roads. Jesus talked about these two roads. He said, "Wide is the gate and broad is the road that leads to destruction, and many people are traveling that road. Narrow is the gate and narrow is the road that leads to life, and few are the people who have found it." That is what Jesus said, and that is the way it is, friends. In this life there are two roads - a road of evil and a road of good. Right from the beginning of life, people start walking the broad road. For example, even very small children know how to lie, how to steal, how to fight, to get angry, and to disobey. When they are older, they do even worse things. Grown up, they rob, kill, get drunk, take other women and such things as that. This is walking the bad road. This road ends in the place of eternal punishment. Those who arrive there are never able to leave. It is the other road, the narrow road, that takes us to heaven. In heaven there is no evil, no pain, no suffering, no sickness, no death - nothing bad - just good things. God is there for us to see, to know, and He will take care of us. 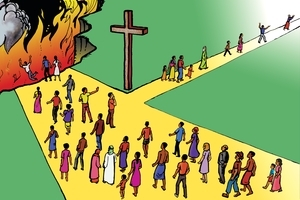 Now friends, if you want to go to heaven, you must choose the road that will lead you there. Jesus said, "I am the way... no man comes to the Father, but by Me." Therefore, Jesus is the way and there is no other. If you wish to enter heaven you must believe in Jesus. Receive His Word and obey it. You must follow Jesus and worship Him. Ask Jesus to take away your sin. Then Jesus will accept you. He will help you now and take you to heaven when you die. GRN has recorded a version of this script in 212 languages and dialects. See full list.